Hair transplantation requires sufficient amount of hairs at the donor areas. In a normal hair transplant procedure, hair is extracted from this hair bearing areas and transplanted to bald areas. Usually the donor area is the back or the top area of the head scalp but sometimes hair loss patient do not have sufficient hair growth in this areas also. When there is absence of sufficient hair growth at donor area or when the patient is suffering from complete baldness in such cases extraction of hairs is done from other significant donor areas. In cases of complete baldness or scarcity of donor area body hair transplant is opted for hair transplantation. BHT is also carried out with advance procedure of FUE the only difference being the donor areas. In such cases donor area can be any other body part which have significant hair growth. 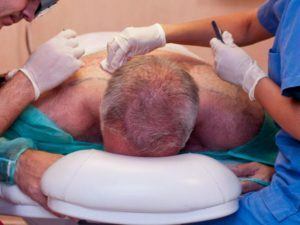 BHT is only opted in the patients when there is no sufficient hair on head scalp for extraction. Body hair transplant follows exactly the same procedure as that of the other hair transplantation procedure but in BHT hair is extracted from the hear bearing body parts other than the donor areas at head scalp using advanced technique of FUE. This body parts may include beard, chest, back, stomach area or any other parts where hair growth is sufficient for extraction this extracted hairs are then prepared and transplanted to the bald areas of the head scalp to achieve full hair growth. This is a suitable hair option for complete baldness patients. Other than hair transplantation at head scalp BHT is also suitable for eyebrow hair transplantation, chest hair transplant, beard hair transplant etc. The donor areas are not specific to the head scalp only as there is wide availability of donor area. BHT can also eliminate hair loss problem in a patient with complete baldness. Body hair transplant adds up extra density to hairs growth and thus more fruitful results can be observed. Body hair transplant does not involve any scars or incision. It can also be used for transplanting hairs to eyebrows and other areas. Body hair transplant at Avenues is performed with advanced technique of FUE. Avenues have all the necessary tools and techniques required for BHT. Doctors have been yielding successful results in BHT from years and thus they have experience in the field. There are very few specialized clinic for body hair transplant and Avenues is one among them.